Here you’ll find links to all of my blog posts (over 500! ), organized by category–Content, Design (with several sub-categories), and Delivery. Stupidity, lies and coverups = literal Death — by PowerPoint, or not? Write for your audience—and a delicious recipe! Why do 60% of students find their lectures boring? What’s your worst experience watching or delivering a PowerPoint presentation? What goes on the last slide? How many bullets should I put on a slide? Tell a story, or where’s the point in all this? Wishing you & the world all the best in 2017! Annoying animation–don’t make people wait for the text to appear! Your presentation deserves the same respect as your website and brochures! Happy New Year — 2014! Wishes for a peaceful, happy, healthy & successful New Year! Create a slide show that really slides! How do you convince your colleagues to present well? New video lesson on YouTube! 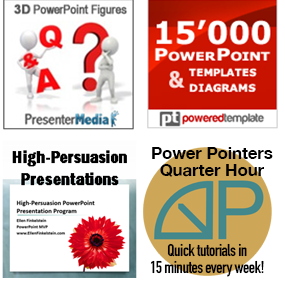 My training webinar: Present interactively-your audience expects it! Congratulations to the winners of the “stickout” photo contest! Results of Extreme Shapes contest! Congratulations to the winners of the summer 3D contest! Which projector do you recommend? Do you give out prizes when you train? Do you sing and dance? Which presenter remote do you recommend? Presentation handouts: Yes or no, what kind, and when? Don’t look at the screen! Should you say “thank you” at the end of a presentation? Let’s have a Distraction Summit!